I’m kind of outing myself a little, but I recently wrote a story for a new Nepali magazine. I wanted to share it (I hope the magazine folks don’t mind) as I really liked how it came together. I was asked to talk about my views as a non-Nepali married to a Nepali, and I see the article as a nice introduction to how I see my world today. “Can you see Mount Everest from your house?” I asked my friend, a native of Kathmandu. We were sharing French fries in the campus cafeteria, and I was making conversation. I remembered the glossy photos of past Everest expeditions in the National Geographic I received each month, like a prize, from my grandfather after he had finished reading. Every article on Everest started with the expedition team departing from Kathmandu; a yellow star on the map followed by dotted lines that connected the city to the top of the world. I assumed the giant mountain towered on the outskirts of the capital, like an ancient skyscraper of rock and ice. I had only been at the university for a few weeks, so I was almost naïve enough to believe him. I knew very little about his country aside from the magazine pictures, an unfortunate side effect of 1990s American public education. High school curricula simply weren’t very “global,” at least when it came to non-Western countries. It has now been almost nine years, and not only have I been to Nepal, I have seen Mount Everest with my own eyes—while panting for breath on the steep upward climb to Namche Bazar. From Kathmandu it took a small plane and two days of hiking to catch a misty glimpse of the mountain, and would take several more days of hiking if I wanted to touch its feet. I have journeyed far in other ways too. I am now part of a Nepali family and my identity includes words like buhari and bhauju. I celebrate American Thanksgiving and Dashain, Christmas and Tihar. Our home is often filled with laughter and conversations with friends in both English and Nepali. I have fallen in love with a man, but also a country. My journey has not been without bumps. I cringe each time my father-in-law greets me at the airport by pinching my arm and exclaiming joyfully about how “fat” I have become. Ironically my mother-in-law compares the amount of rice I eat to that of a five-year-old child, but I have to surrender; I will never be able to keep up in the daal-bhat department. My biggest hurdle has been language—that same hungry five-year-old would clearly beat me in a Nepali oratory contest—but I lumber on, still feeding my mind a few new words every day. In many ways I have become a hybrid. I am American by birth and Nepali by marriage. As the years unfold, our cultures are better interwoven, pulling two worlds together with a tighter thread. As part of the expedition the team hopes to retrieve the bodies of three climbers which have been lying on the trail: Swiss climber Gianni Goltz, American Scott Fisher, and New Zealander Rob Hall (Fisher and Hall were part of the 1996 team that died on the mountain in one of the worst climbing disasters in Everest history, chronicled by Jon Krakauer in his book “Into Thin Air”—a book I admit I have a hard time putting down, even though I’ve read it several times). Namgyal says some families have expressed the desire to leave the bodies on Mount Everest, as they feel this is what the climbers would have wanted. However, the expedition project co-ordinator, Chakra Karki, says that Nepalese people do not want the mountain to become a graveyard. “We respect the sentiments of the family of anyone who has died on Everest,” he said. You can learn more about the expedition by listening to a PRI’s The World audio segment on “Cleaning up Mount Everest” and reading the Nepal News article. 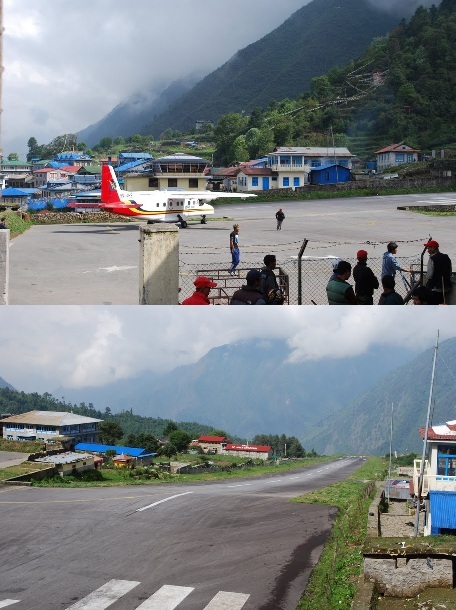 If you google search for lists of some of the most dangerous or scary airports in the world, one airport in particular consistently pops up on the list… Lukla airport in the Solukhumbu (Everest) region of Nepal– and I’ve had the good fortune to have flown in and out of this airport… unscathed. Last summer P and I went on a visit to Nepal for a month, and we were able to kill a few birds with one stone: we visited P’s family, I finally got the chance to experience Kathmandu with P, we were able to attend our good friends’ wedding, and we were able to trek in the mountains as part of P’s preliminary phd research on glaciers and climate change. This included the aforementioned flights. Most people who hike in the Everest region either take a bus or fly to Jiri (which is lower down the mountains and closer to Kathmandu, and is literally the “end of the road” or the last place you can find motorized vehicles in that part of the region) or you can fly to Lukla which is farther along the Everest trek route. Lukla is only about a thirty minute flight from Kathmandu, but feels like worlds away from the bustling, dusty, crowded city. 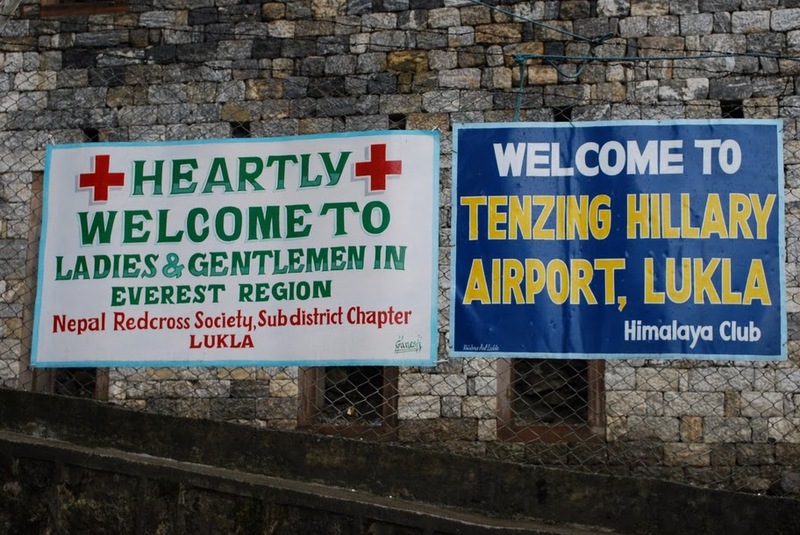 One catches a flight to the mountains at the domestic terminal of Tribhuvan International airport, and climbs aboard a 18 seater Dornier 228 turboprop aircraft. The flight takes off from the valley and flies straight towards the mountains, offering beautiful views of snow-capped Himalayan peaks, lush green valleys and gushing glacial rivers. 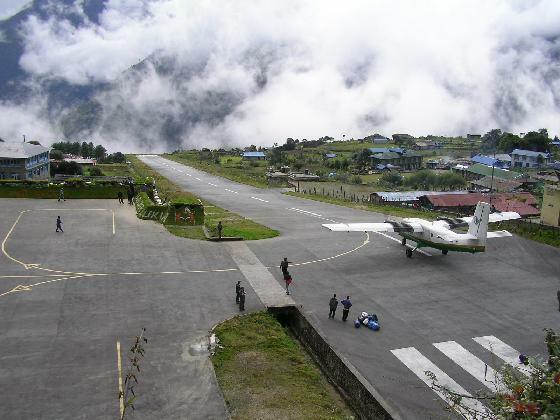 The airport is carved out of a mountain ledge 9,380ft (2860 m) above sea level. Essentially the plane flies straight through the narrow valley before the airport approach, and doesn’t really decrease its altitude… you fly fly fly and then bam, out of the clouds and onto green earth once again. As you watch the ledge approach you can’t help but feel a bit nervous, the runway is short and slopped uphill, there isn’t much room for error, plus the plane is so tiny and feels so vulnerable. When we landed, our plane touched down with a hard thud, and I was waiting for it to bounce off the tarmac and flip on its side, but of course, I’m a bit dramatic. We alighted from the plane, immediately feeling the cool dust-free mountain air, a relief from the pre-monsoon heat of the valley. I had fretted ahead of time about altitude sickness because I wasn’t sure how my body would react (I had a bout of nausea problems on a trip into the mountains in India once). I half expected to feel dizzy getting off the airplane, and keel over on the runway, but I surprised myself by feeling fine and ready to take off down the mountain path. The town itself is pretty small. There are a few shops for buying gear, books, souvenirs, an internet café with satellite connection (which was very slow, very expensive and quite unreliable… but as a friend put it, when you are in the “physically most inspiring place in the world” who needs the internet? ), a few guest houses, a hospital, and a few places to eat including an “Irish Pub,” a German bakery, and a Starbucks knock-off. We didn’t spend too much time in Lukla at the beginning of our journey, so I’ll skip to the end. Most people get stuck in this town on their return to Kathmandu. Due to the perilous perch of the airport’s location, the narrow valley leading up to the airport (and the updrafts and cloud cover that accompany most narrow valleys), the unpredictability of the weather, and the small not-so-gadgety aircraft that fly this route, it is not uncommon for flights to be cancelled and people to be stranded for days at a time. Climate change is something very near and dear to this American-Nepali household. Climate change and glacier melt in the Himalayas is a large part of P’s doctoral work. Over the summer we trekked up into the Everest region so that P could make contacts with local people, researchers and officials. We even randomly happened upon a climate change awareness festival in the shadows of the high peaks. This morning, BBC featured an article on a pre-Copenhagen Nepali cabinet meeting on climate change awareness. The Maldives held a similar meeting not too long ago, and chose to hold it underwater to highlight the very real danger of rising sea levels and the threat to low lying island nations. In turn, the Nepali meeting was held at Mt. Everest base camp to highlight the temperature increases in the mountain region and the threat to glaciers which are important to the waterways of Asia. I wanted to relay the article. You can see it in its original format HERE. 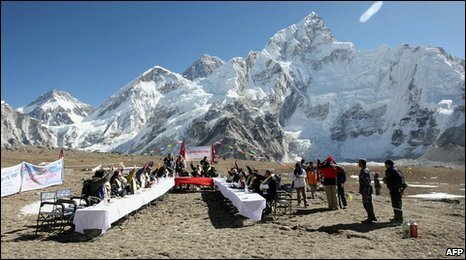 Nepalese ministers have held the world’s highest cabinet meeting on Mount Everest, to raise awareness of the effects of climate change. The ministers signed a declaration on climate change during the meeting, which comes before the Copenhagen climate summit starts next week. PM Madhav Kumar Nepal told the BBC the Himalayas were “a global treasure” that needed to be protected. Studies show temperatures rising faster there than in the rest of South Asia. The studies show the rise has led to a reduced snowfall over the mountains and has caused glaciers to melt. The entire cabinet of 21 ministers travelled in a fleet of helicopters to Kalipatar – a plateau at 5,200m (17,000ft) next to Everest’s base camp. Medical equipment, oxygen canisters, soldiers and journalists had already been ferried to the site. During their half-hour meeting, the ministers – some wearing oxygen masks to help them breathe in the thin air – endorsed a resolution on climate change, which they called the Shara Matar – Top of the World – Declaration. “We wanted to stress one point: that the Himalayas are a global treasure,” Mr Nepal told the BBC. Crowds of local people, many of them wearing traditional outfits, gathered at the village of Syangboche, from where the ministerial helicopters took off. Nawang Tenge, a Buddhist monk waiting to greet the minsters on their return, said the meeting gave him hope for the development of the region. “For us, nature is God. But we are not treating our God fairly and that is why we are facing problems,” he told the AFP news agency. Mingma, a 47-year-old inn keeper, said he was glad the government was “taking initiatives before it is too late”. “Usually authorities tend to act only after accidents. We are now hopeful that something might be done,” he told the AP news agency. Mr Nepal said the mountain range played “an important role in global atmospheric circulation and a centre for unique biodiversity”. “The lofty peaks and mighty rivers have inspired civilisations and supported a mosaic of cultural diversity and because of that we need to preserve Mount Everest, the mountains and all those places downstream,” he said. 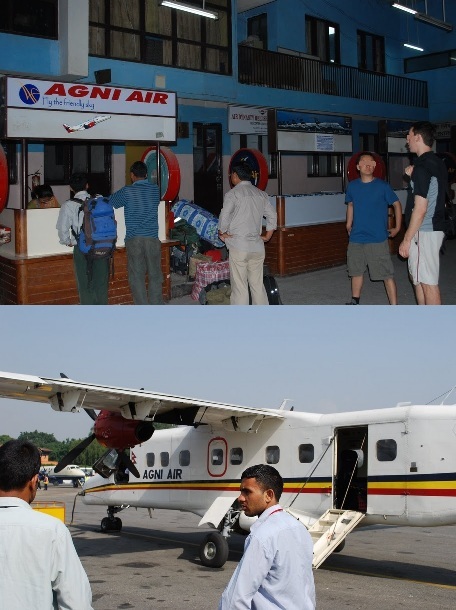 The trip was funded by a group of Nepalese private organisations, many of them from the tourist sector. Environment Minister Thakur Prasad Sharma shrugged off criticism that the meeting was just a costly publicity stunt. “The fact is that the glaciers are melting due to global warming. That has become a critical issue and we want to draw global attention to it,” Mr Sharma told AFP. Mount Everest is the highest point on earth, with a summit 29,035 ft (8,850 m) above sea level. The cabinet meeting comes after the government of the Maldives – the world’s lowest-lying country – held an underwater cabinet meeting in October to highlight the threat to their territory from rising sea levels. I was reading some short Nepali stories this evening and came across one that related to one of my earlier postings (Can You See Everest From Your House?) so I thought I might re-tell the story here. The story was actually written by the mother of one of my friends, so it made me even more interested to share with you. The story is called “Identity” by Bhuwan Dhungana. This had repeated itself many times. He had to forget everything he was supposed to say when it came time to pronounce his name. Often he felt as if his name had no existence at all. He wanted to replace the name with an easier one. But he was compelled to write the same name he had borne since birth, brought all the way from his own to this unfamiliar city. How precious that name was for him! His own name! How easily he could pronounce his precious name as many times as required! His whole family would be linked to his name, his city and his country. He never liked to conceal his name in his city. It was not his country but his name that came first. But in this city… He had to make his country stand out tall against his name. And in that country he had to search out the snowy peaks, find their height, and move his head back and forth in lively descriptions of their natural beauty, although he himself had not climbed them. In fact he was compelled in this unfamiliar city to be Tenzing* to every stranger he met, to be the Himalayas for them. At such times his name ceased to exist. Just now something similar had occurred. After he had introduced himself, the stranger shook his hand and said with a smile, “I know Mount Everest; you belong to it.” He suddenly became listless. How meaningless was his name! He thought of stealing the name of an unfamiliar city; he wanted to change his name. But this was both impossible and impracticable. In this large city he possessed nothing apart from his identity card to protect his existence. He was absolutely alone and helpless. He could name each and every part of the capital of his country. He could get many things done by using his name in his city. But in this unfamiliar city he could not find anyone who could even pronounce his name correctly. Something similar had occurred the day before too. As soon as he entered the office, he offered his hand to a man seated on a chair and told him his name. But the man kept on gazing at him with wonder. He pronounced his name more clearly. The stranger laid out a map of the world in front of him. He looked for the outline of his country on it. He felt a thrill upon reading the name Himalaya. He felt excited. Shaking hands with him, the stranger said, “You belong to Mount Everest.” This time again his name did not surface. He was introduced by way of Mount Everest. This kept occurring to him the whole day. He kept shivering from the icy cold of Mount Everest. At dinner that evening he could not feel proud of his name; he could not roar with laughter at the party. He lay sleepless for a long time that night. he kept thinking: What should a country be like if its name is to evoke instant recognition? What kind of name should a person have? He could not find an easy means by which he could introduce himself. The sentence “You belong to Mount Everest” kept reverberating in his ears. He felt himself to be a mound of snow. The whole night he felt cold. He clung to the snowy peaks in search of the existence of his name. He vacillated for some time. He was forced to publicly proclaim the fact that he had neither seen the mountain directly nor climbed it up. He felt as if he were an announcer announcing Machhapuchhre standing beneath the Himalaya and reducing the whole country into an enclosed area. The big city was larger than his country. There were people from different countries. He was invited to a feast. He had his identity card in his pocket. He too looked busy among the crowd of people. He was lost in a new civilization of a new country. He wished to present his identity distinctly; he wanted to introduce himself by his name but failed to do so again and again. He shrank back during introductions. Before him were tall people. He was forced to stand next to them and to shoulder the existence of the high Himalayas. They were like flames of fire; he, like a melting peak, was turning colder. Every time he became a mountain he turned colder. Every time he was invited to such get-togethers or parties, he found his identity card to be meaningless. He wished to display a large photo of the mountain on his chest before leaving his room- a nice photo, an attractive photo. In a foreign land, he had no better way than this to introduce himself. Taken from Selected Stories from Nepal edited by Sajha Prakashan. *Tenzing Norgay, along with Edmund Hillary, were the first people to sumit Everest. Due to this Tenzing is one of the most famous Nepalis for people from abroad (although sometimes he is considered Indian because he spent a considerable amount of time there). Can You See Everest From Your House? First view of Mount Everest from P and my trek. 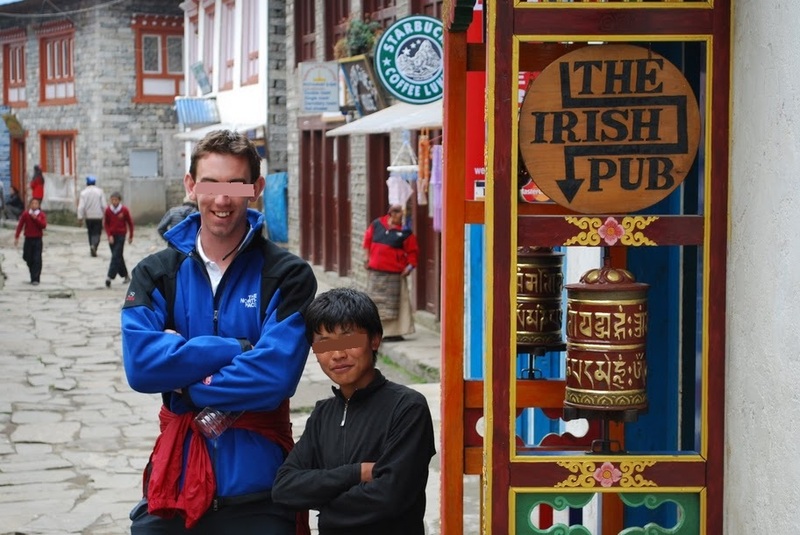 We made a trek to the Everest region in June for P's phd research. It was his first time to Solukhumbu, and we were only able to go 1/2 way to Base Camp due to time constraints. When P and I got back to Kathmandu many people in the city told me how lucky I was to see it, "It is in my country, and I've never laid eyes on it!" Then there is a second group of people, those who have heard of Nepal’s great “claim to fame” Mount Everest (otherwise known as “Sagarmatha” in Nepali and “Chomolungma” in Tibetan) so thus they kind of know about Nepal. I pretty much fell into this category in the beginning. My freshman year in college I made friends with a few Nepali students and I remember a specific (and now kind of embarrassing) conversation. I had always associated “Kathmandu” with the starting point of most Everest expeditions I’d heard about in The National Geographic (my favorite magazine as a kid, heck, still my favorite magazine). I figured the city was basically at the base of the mountain. Nepali friend: “um, yeah… sure… actually we used to climb part of it for gym class in high school. Once I made it to the top and we had a cup of tea.” He had me going for a little while until the blatant sarcasm at the end. And now I know that the mountain is at least an hour plane ride away from the capital! category because of their similarities with each other. Then there is the term “Sherpa” which has become a more generalized word for porters and climbers who help with annual mountain expeditions to Everest and other high altitude climbs in Nepal, Tibet (and sometimes India and Pakistan). Generally these porters are local people (but not always) whose bodies are better adapted to the thin atmosphere and rigors of hiking up and down the mountains. They may or may not be actual “Sherpa” but the term sticks. A running “joke” with one of my uncles insinuates that since P is from Nepal he “must be” a Sherpa. When he sees P coming he calls out, “here comes the Sherpa!” and when my grandmother once asked if P was tired when holding one of my baby cousins my uncle said, “Sherpas are used to carrying heavy things! He’s fine.” After the Sherpa joke was well established, two Christmas’s in a row, two different aunts gifted P a “Sherpa blanket.” They thought it was pretty clever… Nepal has Sherpas, P is from Nepal… he will probably get a kick out of a Sherpa blanket! P is so laid back anyway that he doesn’t take offense or care much either way about the jokes, but it is still a bit odd. I guess it is kind of like people in Nepal giving me cowboy hats for gifts and calling me “Texas” because during an 8 year period the world associated the US with George W Bush who famously considered himself Texan. That’s the only example I can think of. Porters passing us carrying heavy loads up the mountain trail... I just had a back pack, and I was out of breath! I agree, it is actually amazing to see the strength of some of the people up in the mountainous region in Nepal. In Solukhumbu, where P and I did our trek, the only way to transport almost all types of goods into the mountain villages was either by mule/yak caravan or by people hauling stuff on their backs. We watched people carry nearly 110 kilos up steep mountain passes to stock lodges for tourists and bring food and materials to the local people. We passed large stacks of plywood, window panes, large kerosine fuel tanks and boxes of heavy beer and sodas strapped to porters’ backs. The sheer power of the people we encountered was amazing, it was hard work for very little pay… with people often walking long distances in plastic flip flops on muddy steep passes. Since I’m still not great with the kilo/pound conversion (or really any metric-to-standard conversion, I’m terrible in math), the heaviness of what the porters we saw were carrying (110 kilos…more than 240 pounds!!) didn’t really hit home until I was packing our bags for our return flight to the US. Four very large heavy suitcases were about 25 kilos each, a total of about 100 kilos. That was some math I could see! I couldn’t imagine tying these together and carrying them on my back up a rocky path. So, how to now end this somewhat-stream-of-consciousness post? I guess the gist of it is, Nepal might be a small country that’s not on a lot of people’s radars, but good things to know so that you don’t seem silly if you find yourself talking to a Nepali person for the first time–Mount Everest is not at everyone’s doorstep (and no… they don’t run up the mountain for gym class to take tea on the summit), and not everyone is a Sherpa. It is a small place, but quite complex in lots of ways, with a diverse and interesting culture and history to explore. And on a side note, I’ve told P… not to even think about climbing Everest. The risk is too high, and a lot of people come back with badly frostbitten fingers and toes, not to mention other things that could go wrong. After trekking near the mountain I think the idea of climbing it has become a bit alluring, but I stand my ground.